This was the perfect thing for Jacob to take to his preschool friends today. We had everything to do it at home and it took 15 minutes from start to finish. The moon will make it sparkle bright! This magic food will guide them to your home. and Jacob is sure this is going to work. I got the idea and the FREE download for the label here. Idea for a neighbor (with small kids) gift: take one of these baggies, along with some "human reindeer food" (Muddy Buddies in a bag with a pretty bow and a tag). 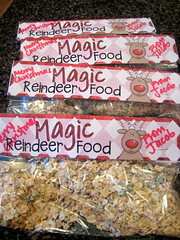 Food for the people and the reindeer!